How are you feeling these days? If you live in the Northern Hemisphere, a long winter may finally be getting to you. Even folks as far south as Florida have been dealing with lower temperatures than they’re accustomed to. Winter is wearing me down but, like everyone else, I’m pressing on. Getting out definitely helps! So where will you be this weekend and will you be birding? Please share your plans in the comments below. I’m taking the kids down to Potter County, PA for a few days of fun and feeder birds. Corey will be birding Jamaica Bay and other nearby environs with official friend of 10,000 Birds, Patrick. Charlie, on the other hand, won’t be going anywhere as Evie has the chicken pox. 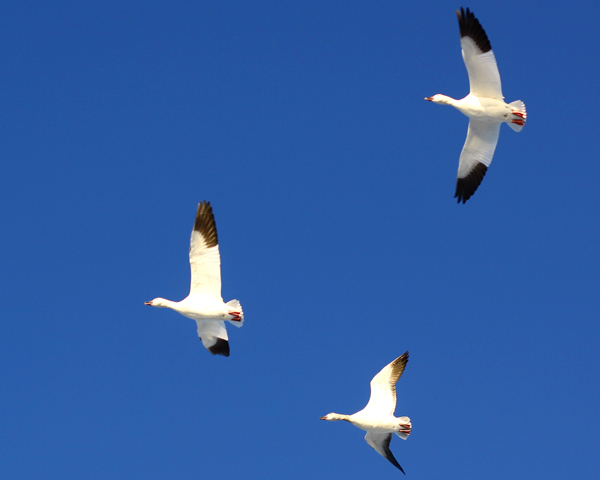 Keep your eyes to the skies for white Snow Geese against the blue! It’s been a while since I’ve had a chance to do some real birding so I’m excited for a full day at Merritt Island National Wildlife Refuge in east Central Florida on Saturday. Hopefully pick up a White-faced Ibis on the way too! The Hunter Bird Observers are off to Seal Rocks – with a lake, littoral forest and headland jutting out into the ocean we’re hoping for a range of birds. Warm tides are bringing northern visitors. My son and I are headed down to the South Shore below Boston with the Hampshire Bird Club. that’s a beautiful picture of geese in flight! Snow Geese! How amazing! Fabulous capture…I love seeing their little legs all tucked up like the landing gear of an aircraft! Beautiful! Wow!! The contrast of the white and black feathers against the brilliant blue sky!! Breathtaking!! The contrast between bird and sky is stunning! Birding a few spots around Tucson, Nice in flight photo! A beautiful sky filled with beautiful birds. I will be in GALAPAGOS for the first time in my life. My wife and I needed a vacation, a honeymoon, and both love birdwatching. I hope some of you can come to Ecuador and visit us some day. Kapiti Island. Stronghold of the Lesser Spotted Kiwi (not that they ar out in the day). Flights captured very nicely! Awesome shot with great details and clarity….